The Islamic Republic of Iran is located in southwestern Asia, bordered by Iraq, Turkey, Armenia, Azerbaijan, the Caspian Sea, Turkmenistan, Afghanistan, Pakistan, the Gulf of Oman, and the Persian Gulf. Iran has an area of 1 ,648 ,195 square kilometers and is the 17th largest country in the world. The population is ±60 million. The state religion is Islam and 99.5% of the people are Muslims. There are small numbers of Christians and Jews as well and the official language is Farsi (Persian). Tehran is the capital city. Other more beautiful cities include Isfahan, Mashhad, Qom, Shiraz and Tabriz. The terrain is rugged and mountainous with a central plateau. A large part of the Iranian plateau is desert. Iran is mostly arid or semi-arid with subtropical weather along the coast of the Caspian Sea. The country has few lakes, and the largest is Lake Urmia – 4,700 square km). The Golestan Forest National Park is on the UNESCO Mountains of the World list and was the first National Reserve in Iran. Kavir National Park is a desert regional park. Other protected areas include Gano Protected Region and Lar Protected Area. In April-May 2003, I visited this splendid country for the first time for three weeks. A lot of people think of Iran as a heap of sand that isn’t rich in plants and nothing could be less true! Contrasts in the landscape are enormous. One minute you’re in the middle of a snowfield at -3C° and two hours later you’re standing in a sand dessert at + 28 C°! 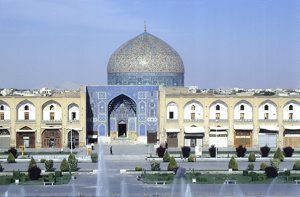 The landscape is fantastic, but so is the splendid architecture in cities like Esfahan, Qom, Qazvin, Bonab and in Zanjan . You can sometimes imagine yourself in a fairytale out of A Thousand and One Nights! The Iranian people are very pleasant and friendly. If you want to travel in Iran, it’s recommend to have a guide who speaks English. However, if you travel in the larger cities, students regularly approach to chat in English. When you come to Tehran you can’t help but see the Azadi Monument, built in 1971 to mark the 2500 year existence of the Persian empire. Tehran is not a city for a long visit, due to the quantity of cars, and there are frequently problems with smog. North of Tehran, in the Elbrus Mountains, lies the highest mountain of Iran, the Kuh-e Damavand at 5671m. The Elbrus Mountains stretch along the Caspian Sea and appear in some places like the European mountains. This resemblance is due to the influence from the sea, which brings a great deal of precipitation. East of these mountains is an area called Golestan. This region is also very rich in bulbous plants and here can be found fields full of tulips. In the province of Gilan, west of Tehran and close to the large city of Rasht, lies the characteristic village of Masouleh. Approximately 4 hours drive from Masouleh in the direction of Ardabil and over the Asalem Pass (2300m), you can see thousands of snowdrops in flower. 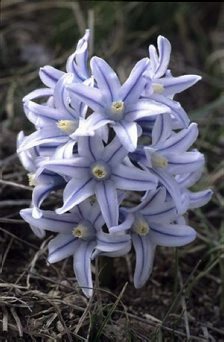 Between the white snowdrops you will see many deep blue scillas, producing a beautiful color contrast. 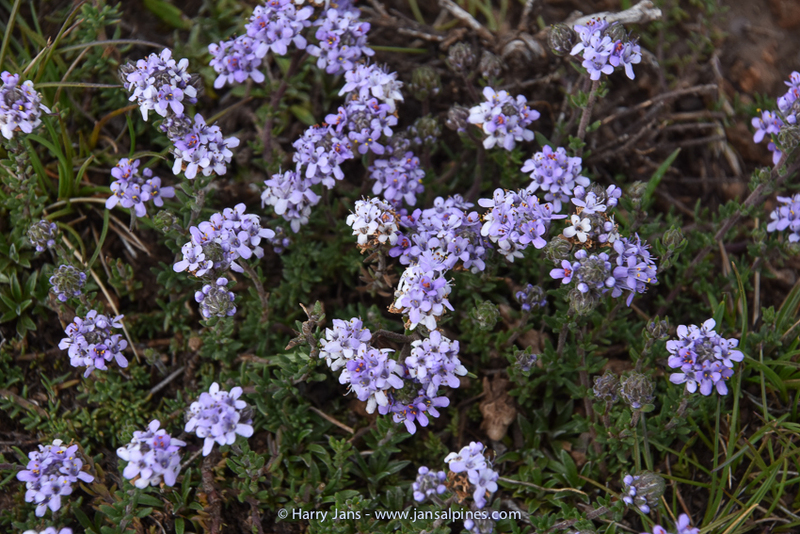 In the west of Iran, between the cities of Ardabil and Tabriz, you will find a completely different flora. 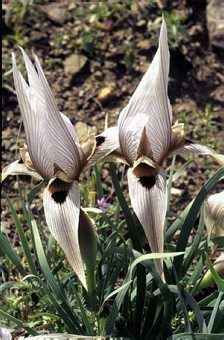 On the slopes of the Kuh-e Sabalan and the Kuh-e Sahand you can find splendid Colchicum and Iris in several species, types, and colors. The most well-known mountain chains are the Zagros mountains which run northwest to southeast. 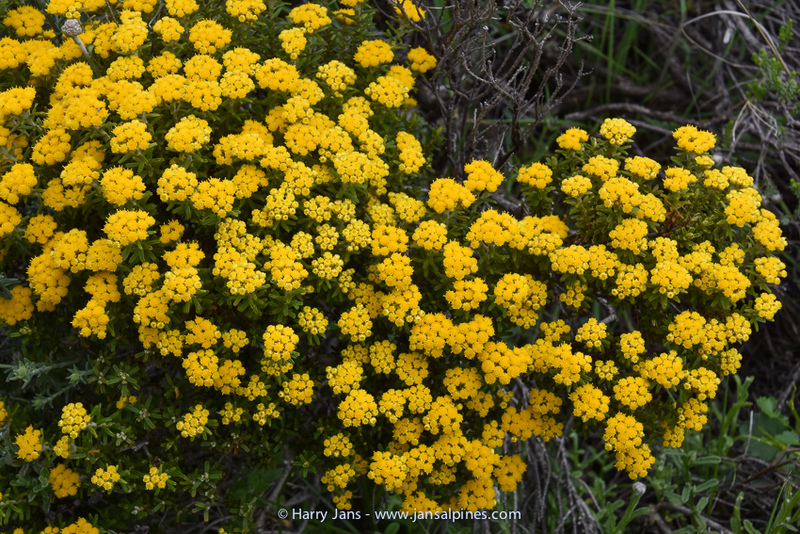 These mountains accommodate a treasury of endemic plants. 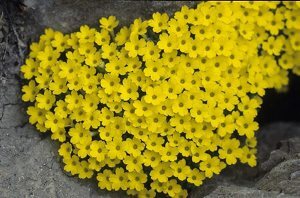 They are not only the home of a number of Dionysia species, but you can also find a very large number of bulbous plants. 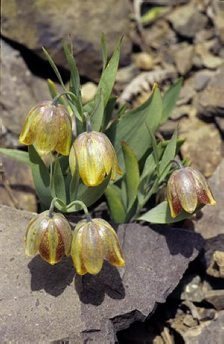 Everyone knows the Crown Imperial, Fritillaria imperialis. and this plant grows here by the thousands. A beautiful scene is created by this splendid plant with orange red flowers among mountain peaks covered in snow against a sheer blue sky. What more can you wish for? I can recommend that everyone visit this country once. 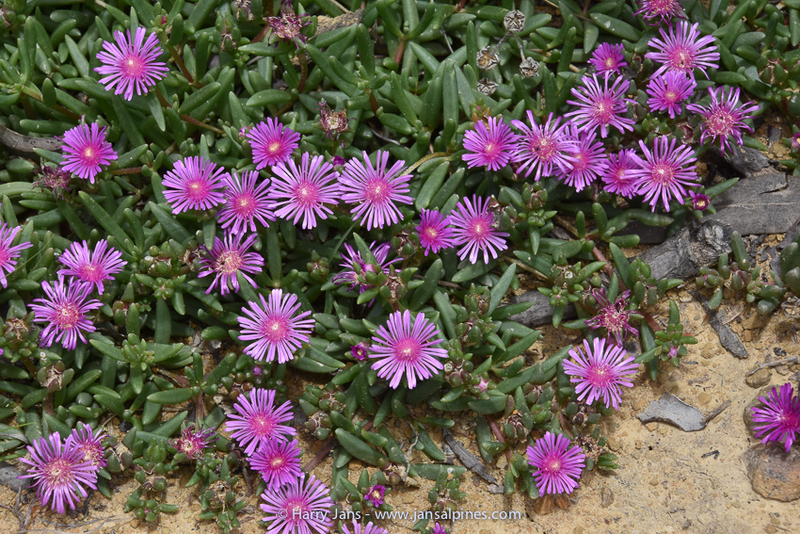 However, do take into account that you must drive many kilometers to see a good mixture of plants. Fortunately, the roads are good and fuel is very cheap. Women must also be aware of certain clothing regulations. For more Iran images 2017 trip click here.